SESP graduate student Lisa Weber sips a Revolution Brewing beer over conversation with her husband, Rob Mohler. Mohler, himself a fan of Peckish Pig's house IPA, India Panic Attack, discovered the new microbrewery through a Google search of local bars. Jamie and Debbie Evans, owners of Howard Street’s new restaurant the Peckish Pig, want to run a brewpub where people rave about the food as much as the bar. The former partners of The Celtic Knot on Church Street opened the doors to Evanston’s first brewpub just two weeks ago, and lots of customers have already visited the restaurant, the owners said. 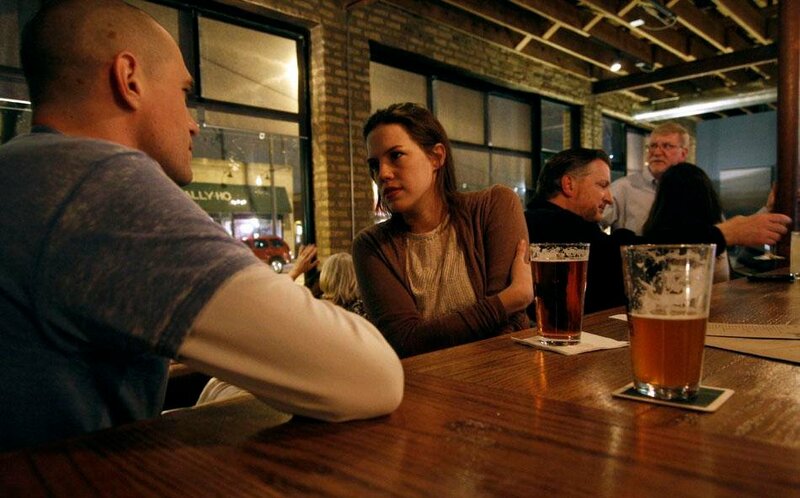 The Peckish Pig, deemed a “laid-back brewpub with gastro pub chow” on its website, has attracted a mix of Evanston and Chicago residents to its rustically designed spot. The Evanses named the restaurant, 623 Howard St., for the colloquial British English word “peckish,” which means hungry. The brewpub serves dinner on the weekdays and brunch and dinner on the weekends. Jamie said the neighborhood on the outskirts of Evanston does not have enough restaurants and bars to visit, especially in the past 20 years. Head chef Debbie, Jamie’s wife, cooks menu items such as “Fish on a Plank” and “Fried Ham Hock with Salted Caramel,” distinguishing the gastro pub from other bar fare in competing pubs in Chicago. A caramel ice cream sundae, the “Heavenston Ice Cream Sundae,” is one of many sweet additions to the savory menu. The owners said the restaurant has a diverse cocktail and beer menu. A new house brew IPA is currently on tap, and wheat and golden ales are being tapped later this week. The brewpub will also be selling growlers — fresh, take-home jugs of beer — beginning this week. The restaurant’s interior is decorated in a contemporary rustic style, with dim lighting and furnished seating areas. Water and soft drinks are served in sky blue mason jars, and utensils like steel buckets and wood planks complement the menu’s Midwestern comfort food. Debbie often leaves the kitchen to hand deliver entrees, while her husband monitors the bar, keeping a friendly presence in the new restaurant. Stevhan Siegel, an Evanston resident, was pleased with the food and beer he tasted at the Peckish Pig. The couple also owns Taste Food & Wine, a retail wine store in Chicago’s Rogers Park neighborhood, a few blocks away from the Peckish Pig. Jamie said they have seen many customers from the wine bar coming to their new gastro pub. With upscale speakeasy Ward Eight next door to the Peckish Pig, Jamie said he feels optimistic about the revival of Howard Street’s restaurant and bar scene. The restaurant is closed Monday, open for dinner Tuesday through Friday and open for brunch and dinner on the weekends.